Monday's post focused on key economic indicators. Today's post focuses on key financial indicators, which for the most part are market-driven and available in real-time. As such, they should carry more weight in one's assessment of the economy's fundamentals. They aren't subject to estimates or adjustments or revisions, and they are the net result of the fears, hopes, judgment and actions of countless millions of economic agents and investors. Right now, they paint a picture of a market and an economy that are fundamentally healthy, even though investors are still worried about the future. If I were stranded on a desert island and could only access one chart to tell me what was going on in the world, Chart #1 is the one I would pick. There are many ways of thinking about swap spreads. (For a detailed explanation, see this post of mine from many years ago.) 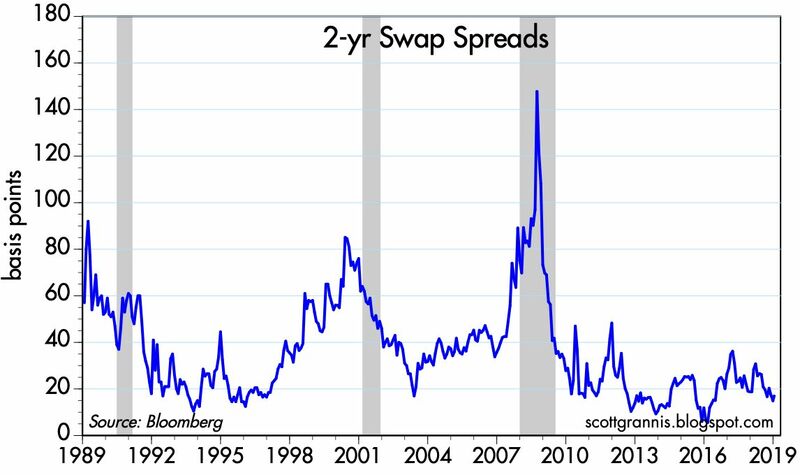 Swap spreads are excellent coincident and often leading indicators of financial market and economic health. 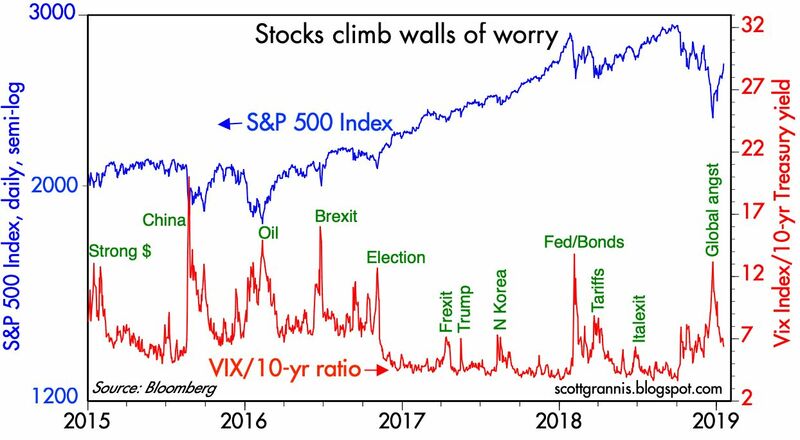 When spreads are low, liquidity is generally abundant, risk aversion is low, systemic risk is low, and the economic outlook is generally healthy. 2-yr swap spreads today are unusually low, less than 20 bps. Among other things, this tells me the banking system is healthy and there is no shortage of liquidity. Morever, market participants are willing and able to manage risk in a variety of ways. That's an essential function of markets: to redistribute risk from those who don't want it to those that do. 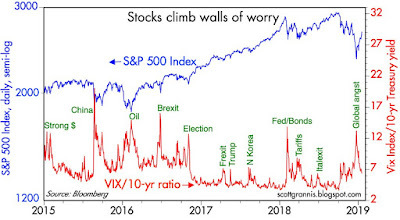 When markets are free to operate and those who worry are free to reduce their risk, panic is short-circuited, and there is no rush for the exits. Low swap spreads act like grease for the wheels of finance, and healthy financial markets are a necessary, if not sufficient, condition for a healthy economy. This is very positive. After swap spreads, I'd want to know what the Fed was doing. For that, I'd pick Chart #2. Although they rarely mention it, the Fed's primary monetary lever is the real Fed funds rate (the nominal rate minus inflation according to the Core PCE deflator). That's the rate that really matters to the economy, not the nominal rate; 5% interest rates in a zero inflation world are much more onerous than 5% rates in a 4% inflation world. 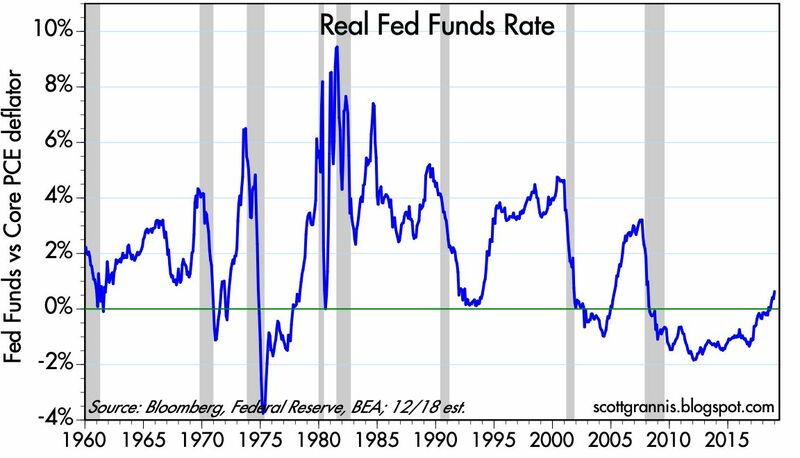 As Chart #2 shows, it turns out that every recession in the past 60 years has been preceded by a significant rise in the real Fed funds rate. What was the Fed doing to make real short-term rates rise? It was draining reserves from the banking system. Faced with a shortage of reserves, banks needed to bid in the Fed funds market for reserves (reserves are required to collateralize deposits), and that had the effect of pushing up overnight lending rates. Rising real rates made borrowing more expensive, and it made holding cash or cash equivalents more attractive: the net result was an increased demand for money. So, prior to every recession the Fed effectively starved the markets and the economy for money (because the demand for money exceeded the supply of money), until economic activity slowed down and a recession set in. Then the Fed began to ease, and the economy began to recover. Lather, rinse, and repeat. It's going to be different this time, however, because since late 2008 the Fed has changed the way it operates. Bank reserves used to pay no interest, so banks always tried to minimize their holdings of reserves. Today the Fed does pay interest on reserves, so now reserves are a potentially attractive asset class, not a deadweight burden for banks. Reserves today are essentially T-bill substitutes that the Fed created by buying notes and bonds from banks: they pay a floating rate of interest and they are default-free. Not surprisingly, today the banking system is happy holding some $1.6 trillion of excess bank reserves. Banks have all the reserves they could possibly need to cover a potentially huge increase in lending activity, but they are content to hold excess reserves in lieu of making more loans. Bank lending is expanding today at a reasonable rate, and inflation is low. The main reason the Fed has been trying to reduce its balance sheet is to minimize the risk that a huge amount of excess reserves might encourage banks to lend too much and to thus over-expand the money supply, which in turn could cause a lot of inflation. But so far, raising the interest rate it pays on reserves has been sufficient to induce the banks to view excess reserves as a valuable asset, not as a means to expand lending. 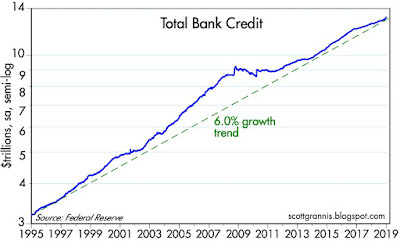 In the 5 years preceding the crash of 2008, Bank Credit grew at a 9.4% rate (see Chart #3). 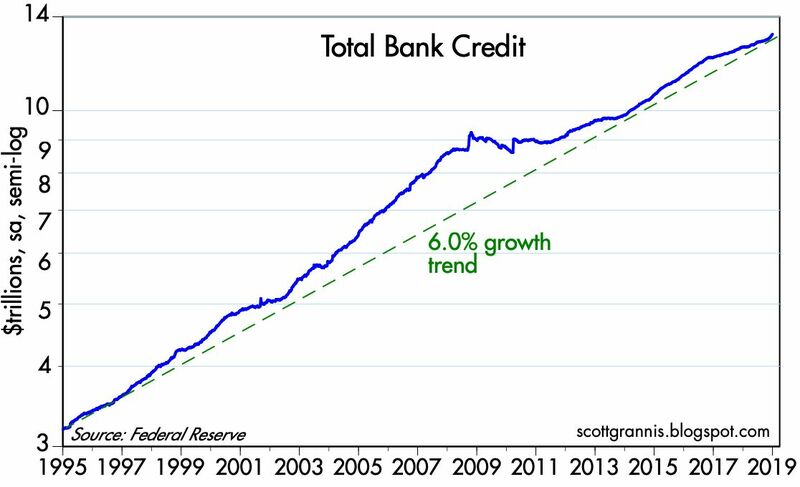 Since the economy began to recover in mid-2009, Bank Credit has expanded at a 4.1% annualized rate; over the past 5 years, Bank Credit has expanded at a 6% rate. Bank Credit growth has picked up a bit in the past few years, but it is clear that banks are not creating new money with abandon, as they seemingly did in the run-up to 2008. The Fed, in other words, has managed to find the interest rate that appears to balance the supply and demand for money. That helps explains why inflation has been low and relatively stable, and the dollar has been reasonably strong and relatively stable. 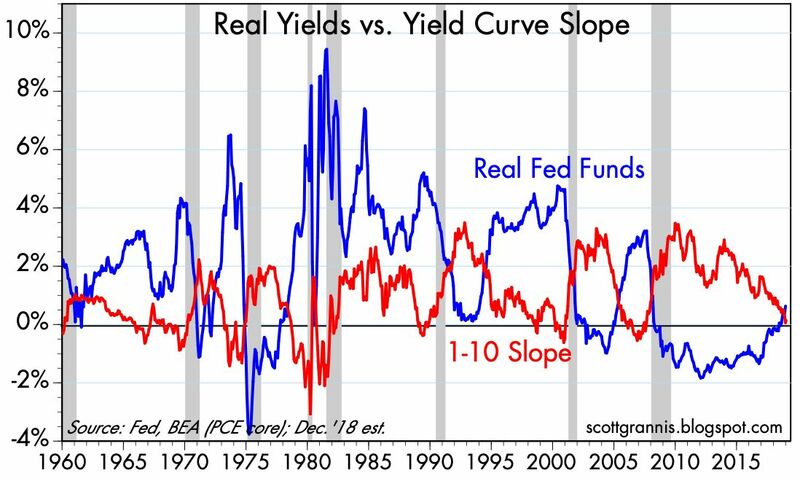 The yield curve today has become a lot less steep than it was not too long ago, but real short-term interest rates are still relatively low. All that tells us is that the market now expects the Fed to be on hold for the foreseeable future. Consider Chart #4, which shows the Dec. '19 Fed funds futures (i.e., the market's expectation for what Fed funds will trade at come December). Fed expectations a few months ago called for two more tightenings, but the economy's weakness and concerns over trade tensions, etc., have convinced the market (and also the Fed, which recently apologized for threatening to raise rates more) that this won't happen. Today's funds rate target is 2.4%, and the Dec. '19 Fed funds futures rate is trading at just under 2.5%. So the market expects the Fed to essentially be on hold for at least the rest of this year. This is an important variable to watch, since it is tied directly to the market's perception of whether the economy is gaining or losing strength; for example, any tendency towards a stronger economy would cause the market to raise its expectations for where the funds rate will be come December. Chart #5 sheds further light on market expectations for Fed policy. 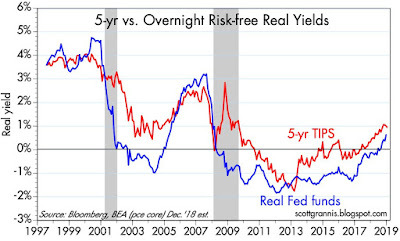 The real Fed funds rate (blue) is the overnight real interest rate that sets the floor for all other rates (it's also the same rate that appears in Chart #2). 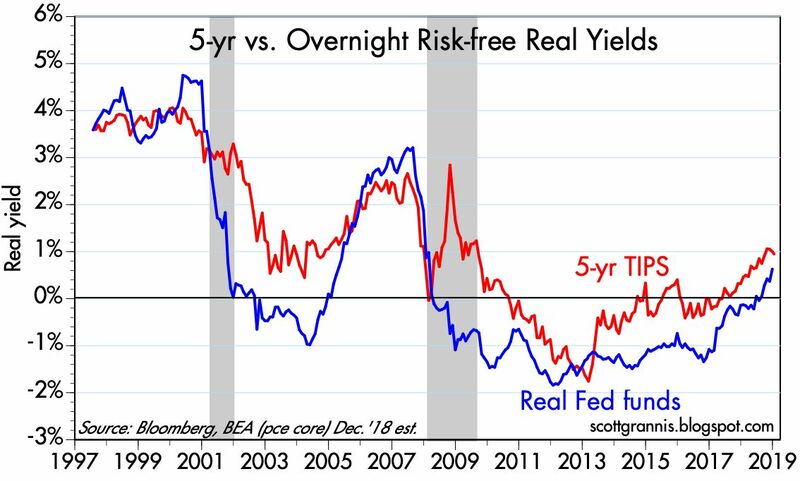 The real yield on 5-yr TIPS (red) is a good proxy for what the market expects the real Fed funds rate to average over the next five years. 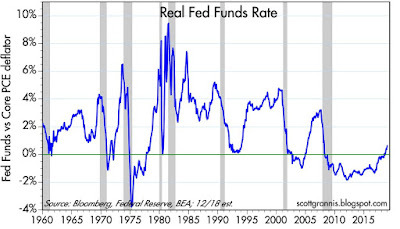 The current real funds rate is about 0.6% (a 2.4% Fed funds target minus a core PCE inflation rate of 1.8%). The market expects the real funds rate to average about 0.9% over the next 5 years—a very modest tightening of policy, but certainly not an easing. Note the relationship between these two variables. 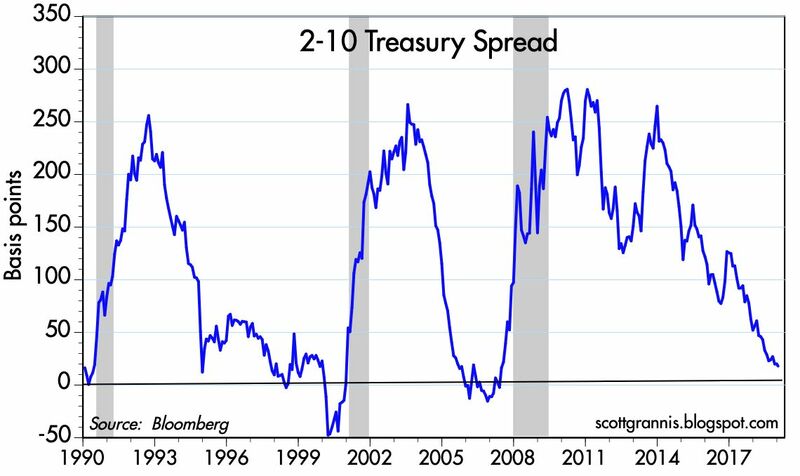 The real yield curve tends to invert prior to recessions (i.e., the blue line exceeds the red line). 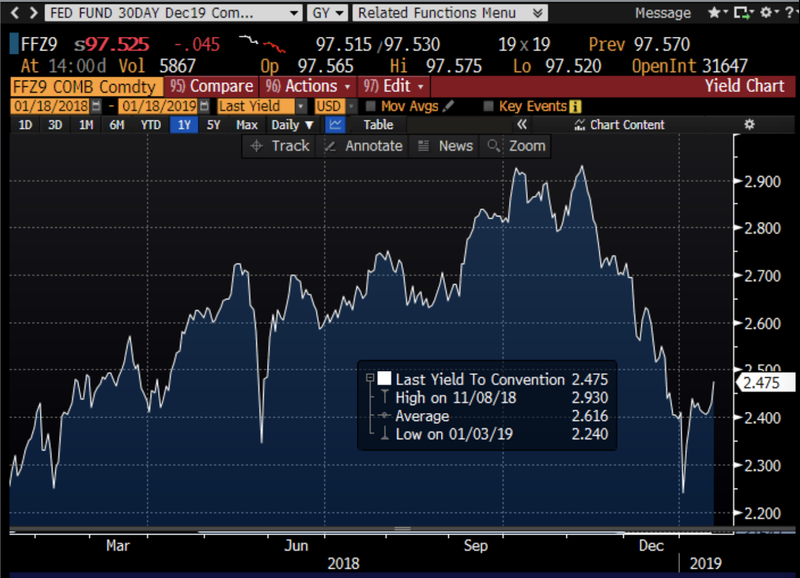 This happens because the bond market senses that the Fed is so tight that it is undermining the economy, and that in turn will lead to a recession and much easier Fed policy in the future. 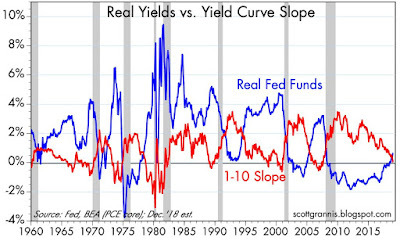 Currently the real yield curve is still positively sloped. 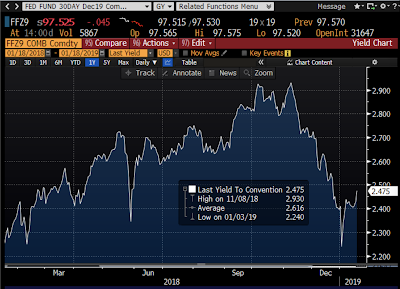 The bond market is not signaling a recession, but neither is it signaling strong growth—real yields are still relatively low. Chart #6 shows one popular measure of the slope of the nominal yield curve: the difference between 2- and 10-yr Treasury yields. By this measure the curve is pretty flat, but it's not inverted. It's been like this several times before in recent history without a recession immediately following. Chart #7 is another measure of the slope of the yield curve, with the key difference in this case being that the market's expectation of where the funds rate is going to be in the near term does not play a role (as it does in Chart #6, since the 2-yr Treasury yield is effectively the market's expectation for what the Fed nominal funds rate will average over the next two years). 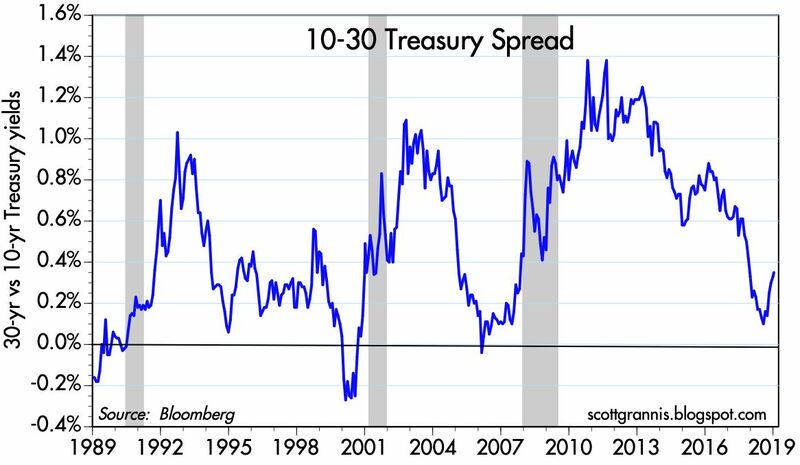 The difference between 10- and 30-yr yields is a function of the market's long-term expectations for economic growth and inflation. 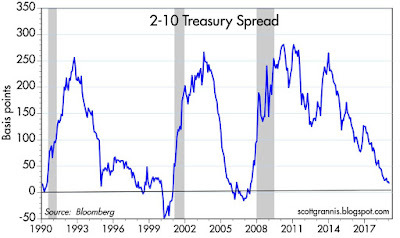 A positive slope is the norm, and a negative/inverted spread is a sign of trouble. What we see today is fairly routine for an economy in mid-cycle. Indeed, there are lots of similarities between today and the mid- to late-1990s, when the economy was booming and the Fed was beginning to tighten. Chart #8 shows 5-yr Credit Default Swap Spreads. 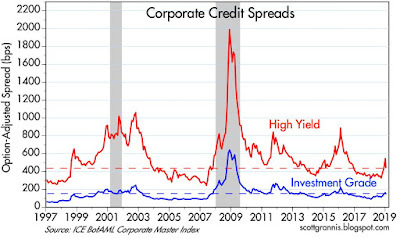 The market for CDS is highly liquid, much more so than for individual corporate bonds. Buying CDS contracts is equivalent to buying a basket of bonds, and selling CDS is equivalent to selling a basket of bonds. 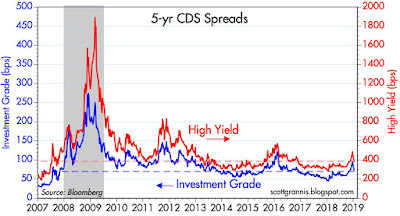 If you have a portfolio of corporate bonds and become nervous about a general weakening of the economy, you can hold on to the individual corporate bonds you like and sell CDS to cover your risk of a generic rise in credit spreads, for example. 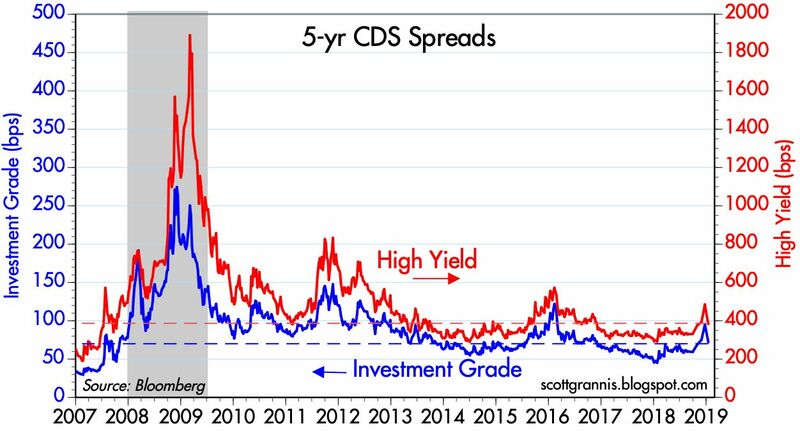 Currently, CDS spreads are relatively low, and down from their recent highs. As we'll see in Chart #10, one of the main drivers of wider corporate bond spreads is the recent, sharp decline in crude oil prices, similar—though to a much lesser extent—to what we saw in late 2015. 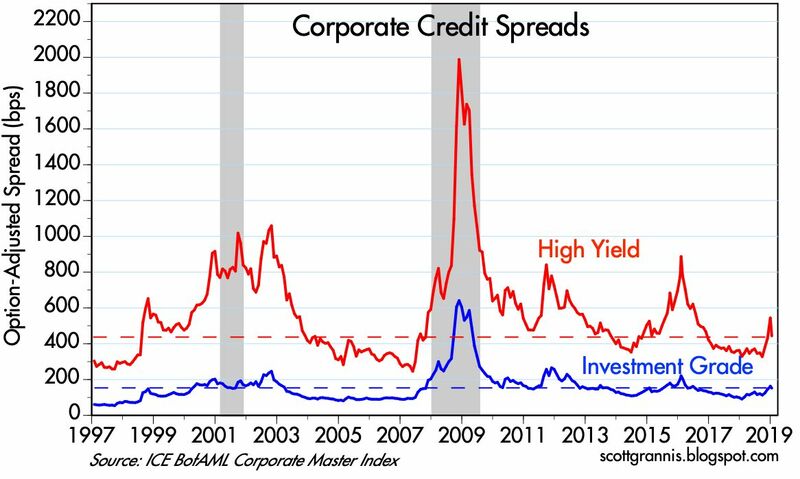 Chart #9 shows credit spreads for Investment Grade and High Yield corporate bonds, which tell a similar story to that told in Chart #8. Credit spreads are somewhat elevated, reflecting caution, but not signaling great risk. And they have declined meaningfully in the past week or so. 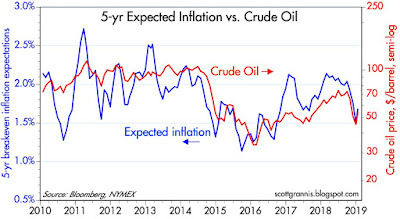 Chart #10 shows that the recent sharp decline in crude oil prices closely tracks the decline in expected inflation. 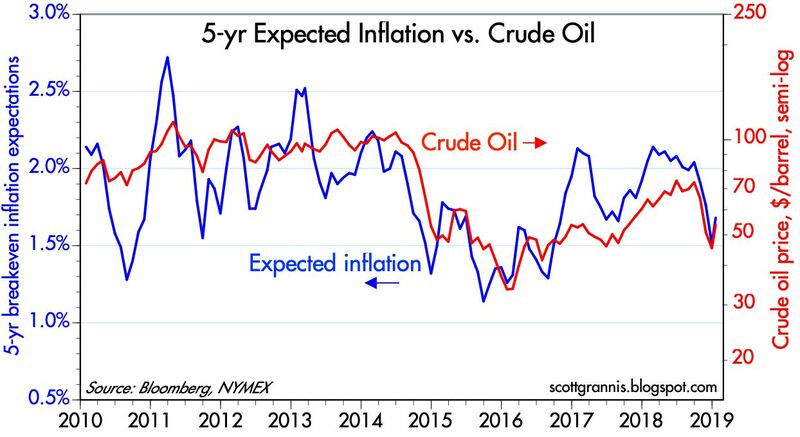 Lower expected inflation is thus not the result of overly-tight Fed policy. 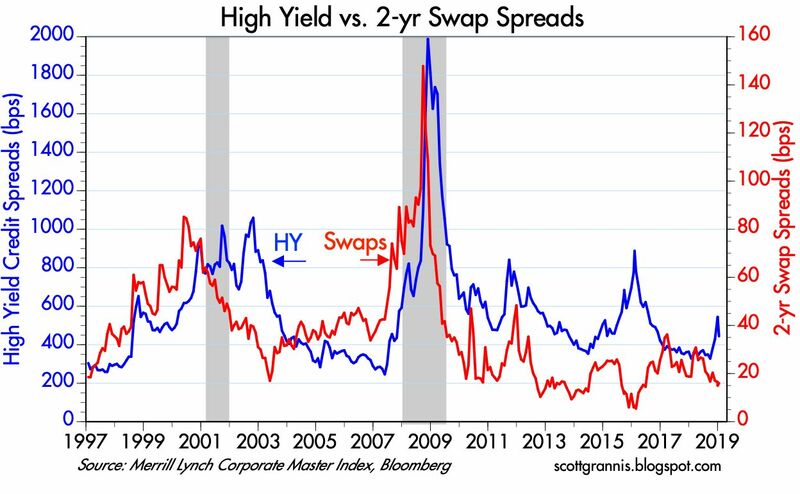 Chart #11 compares 2-yr swap spreads to the spread on high-yield corporate bonds. 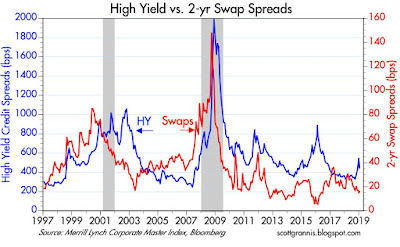 Note how swap spreads tend to lead credit spreads. 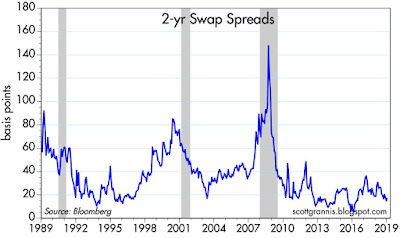 For the past several years swap spreads have been relatively low (a normal trading range would be 15-30 bps). Throughout that period swap spreads have correctly diagnosed the "problem" behind wider credit spreads to be due to nerves, not fundamentals (i.e., fears that lower oil prices would threaten the oil-related sectors). 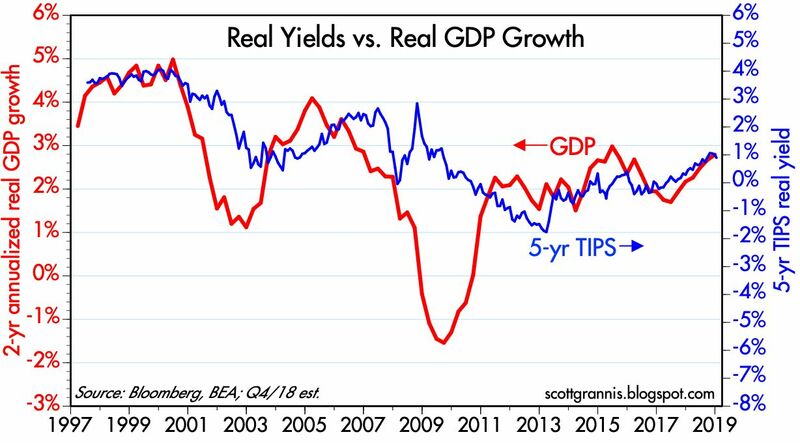 Chart #12 shows that the level of real yields tends to correspond to the economy's real growth trend. When the economy was booming (4-5% GDP growth) in the late 1990s, real yields were 3-4%. More recently, the economy has been growing at a 2-2.5% pace, and real yields are about 1%. This reflects the market's belief that it is quite unlikely that the economy will pick up significantly from its recent pace. I happen to think the market is being too pessimistic on this score. I think there is a lot of untapped potential in the economy that could be realized if and when tariff wars recede and some today's pressing problems are gradually resolved. 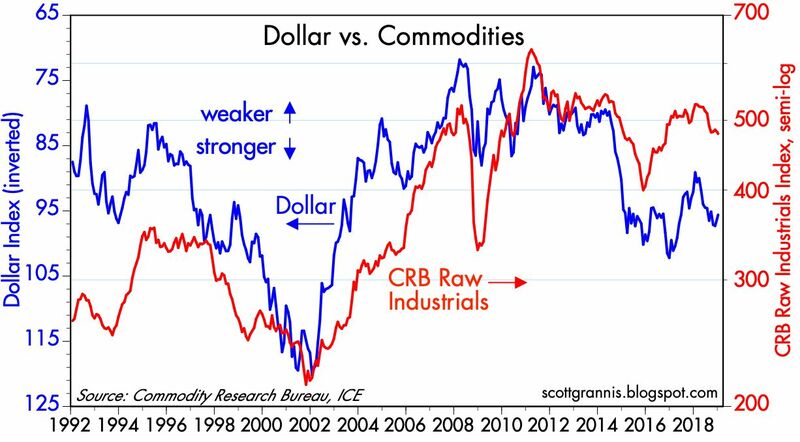 Chart #13 shows that there tends to be an inverse correlation between the value of the dollar and the level of industrial commodity prices. But not always. 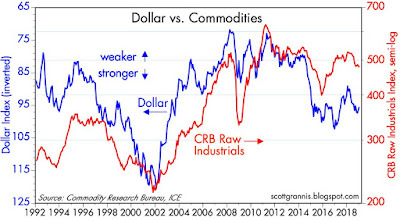 Currently, the dollar (blue line) is reasonably strong, and commodity prices are also relatively strong. I interpret this to mean that the global economy (and thus global demand for commodities) is relatively strong. This runs counter to the prevailing narrative which claims that the global economy, in particular the Eurozone and the Chinese economies are very weak. It also runs counter to the prevailing fears that a strong dollar will prove destructive to emerging market economies, since a strong dollar tends to push commodity prices down, and that in turn punishes those economies most dependent on commodity exports. Chart #14 is another one of my favorites. What we see here is that the primary driver of equity selloffs in recent years has been FUD (fear, uncertainty, and doubt). As most of the charts above show, the economy's fundamentals remain sound. The Fed is not threatening, inflation is not too low nor too high, the economy appears to be gaining strength, the outlook for corporate profits is healthy, and financial markets enjoy plentiful liquidity. So far this theme seems to be holding for the latest selloff: as fears (as proxied by the ratio of the Vix index to the 10-yr Treasury yield) subside, prices are rising. The equity market has already recovered a bit more than half of what it lost since early October. Chart #15 compares Warren Buffet's favorite measure of equity valuation (blue line) to the inverse level of 10-yr Treasury yields (red). It suggests that equity prices had reached high levels relative to nominal GDP earlier this year, but that this has been "corrected" by the recent decline in equity prices combined with ongoing growth in the economy. The chart further suggests that the current valuation of the market is consistent with the level of interest rates (compare the current period to the late 1950s and early 1960s). That equity valuations using the Buffet measure tend to inversely track the level of interest rates over time is not surprising, since lower lower rates result in a higher discounted present value of future profits, and vice versa. Finally, let's look at something interesting from China. 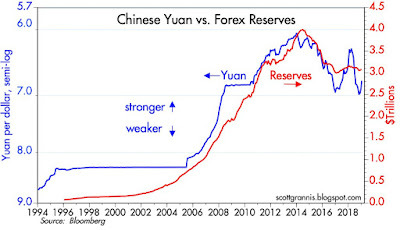 Chart #16 compares the value of the Chinese yuan to the level of China's foreign exchange reserves. Here we see that the yuan has taken a beating in the past year or so (undoubtedly as a result of a significant reduction in the pace of China's real growth and a significant increase in uncertainty surrounding the Trump tariff wars). But it's very interesting to see that China's forex reserves have been holding fairly steady for the past two years. 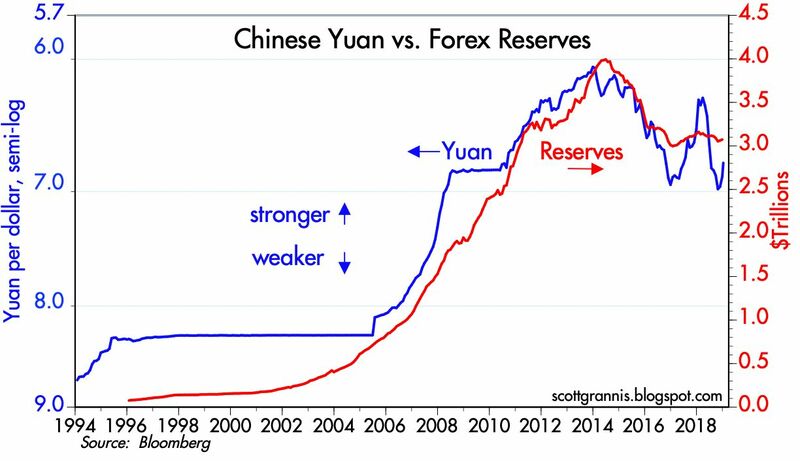 This tells me that China's central bank has been successfully stabilizing its holdings of reserves by allowing the yuan to fluctuate within reasonable limits. This further implies that the central bank is keeping the supply of and the demand for yuan in balance, which should keep China's inflation low, help stabilize the economy and in turn restore confidence in the currency. The recent upturn in the value of the yuan likely reflects the market's belief that a resolution to the US-China Trade War could be in the offing. I wouldn't be surprised at all, since Trump's ultimate objective is a reduction in tariffs and subsidies, and that in turn would be good news for both the US and Chinese economies. Despite all the worries, there are reasonably strong signs in the financial market's entrails that things will work out well in the end. These are my favorite favorite posts. They say so much and keep everything g is such a rest perspective. I expect equities to retrace 50% to 100% then off to the races higher for the rest of the year. The drags/worries on equities will resolve themselves over time. Scott, thank you for posting. You’re on record as a bull with no recession forthcoming which I agree with. How about posting your favorite charts and/or indicators that would indicate a recession and bear market may be imminent? I haven’t seen you post many sentiment statistics except perhaps the VIX. It seems these may as good as any in predicting the near term direction of the market. I also wonder how much of a “Trump” discount we should assign the the market’s current valuation given the constant barrage of negativity toward anything Trump. Keep up the good work. Scott, thanks so much for posting. You simplify the status of the economy very concisely with data and expertise. It is great to find such clarity of thought process amongst all of the noise in the media. I look forward to your posts. Thanks! read flash boys guys. stop reading this nonsense. Marcus: I guess you'll have lead by example and stop reading this blog you insist is worse than worthless. Thank you very much for your article. Very useful. You provide clear and objective references to avoid falling into market moods. Thank you. pangloss: shame on you for fake news. you know my point. you are leading the sheep to slaughter. albeit with no malice, but with gross negligence spawned by your vanity. the bonfire of the vanities indeed. ever correctly predict a recession! as if all the other nations don't exist. will have no effect on the US economy. with the US, which is exactly what Trump wants to change! than at any time in my life, and I'm 65 years old ! and that can't be good for investor confidence. "The charts show the past"
Cliff, surely you're not suggesting that you have charts that show the future? Marcus: There was nothing at all in Scott's charts that weren't facts. Pure facts. To the extent Scott interpreted or opined on those facts, those interpretations or opinions were clearly delineated. And this is bolstered by the fact that Scott knows his audience are adults well-versed in the risks of the markets. Too, I'm nearly certain that all of these people read market opinions by many people not named Scott Grannis. Basically, we're all big boys and girls and live with the consequences of our actions. For you to allege "fake news" is something that is beneath decent people. There's nothing fake about it. You just seem to disagree with the broad interpretation. That said, I'm not even sure THAT is true because you never actually support your arguments with facts or anything else. All you do is attempt to tear down someone who's done far superior work to anything you've done (which is nil). I truly don't know what ax it is you're grinding. If you're so concerned with the financial welfare of Scott's readers then make the compelling case for an opposite conclusion. Please, I'm begging you, stop the unproductive and asinine insults. It should be beneath you. To Scott: I salute the FREE service you provide to those of us who like reading varied opinions of the market. I think you do terrific work and I have learned a great deal from your insights and observations. Channeling Marcus re Marcus: illegitimi non carburundum! MG Hammer: You, as is the wont of people who use fake latin, misread the reference to fake news. Pangloss knows it was fake news to accuse me of something I never said. Plus he knows its circular to tell the fireman to lead by example and stop shouting fire. I grind no axe, but in your search for the "hero" i guess i grind your gears. Keep begging, it will fulfill your need to vilify me, and probably please Cliff and JBG. Matthew, don't waste your typing on marcus. Until Scott decides to deny his comments, they'll continue. I actually have grown to anticipate them. Dare I say I chuckle from time to time? They are called "leading indicators"
There is one at the URL I posted in my comment. Cliff, I visited your site and viewed the graph and indeed you have a point. That said, leading indicators-which any real time graph will show, do not look into the future but rather state the present and it is up to some speculation to gauge their meaning. Do do bring up a salient point re looking at non-US based data for clues. Scott, care to comment? steve: one needs to look all over the place for clues. Any fact you run across is obviously dated, and I know of no indicator which is guaranteed to be a leading indicator. Common sense is a key ingredient to predicting the future based on current realities. As for weakness in Europe, there is no law that says a weak Europe is a leading indicator for a weak US. If there were any iron-clad leading indicators out there, the market would have discovered them long ago, and that would have long-ago rendered them nearly useless. Markets move when the future turns out to be different from what was expected. "If there were any iron-clad leading indicators out there, the market would have discovered them long ago, and that would have long-ago rendered them nearly useless"
Absolutely true! Thank you, Scott. and that would have long-ago rendered them nearly useless. There ARE iron-clad leading indicators out there. so they are usually ignored. and the current "everything bubble" (2018). The best leading indicators may differ from cycle to cycle. market prices peak soon after. market prices bottom soon after. look / feel best before the fall. ... but it just deteriorated to Neutral yesterday. Not my fault -- my cat walked across my computer again. give us the the foxes, the little foxes, that spoil our vines, for our vines have tender grapes. Marcus is funny because I think he is clueless on economics, finance and governments. The Donald J. Trump stock market bottom of Dec 24 is still intact. Apple revenue declined, and they lowered guidance. Stock up over 6% anyway. This market wants to be strong. 3mo/10yr and 2yr/10yr treasuries too close for FED hiking absent big inflation expectations. Also 10 yr still weak. Good data or not seems something's still not quite making sense. 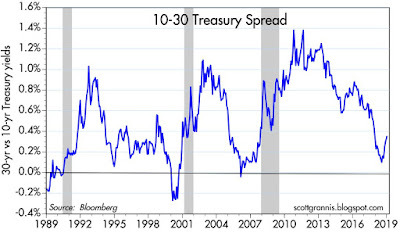 Maybe if we see 10 and 30 yr treasury yields strengthen this might look "stronger."